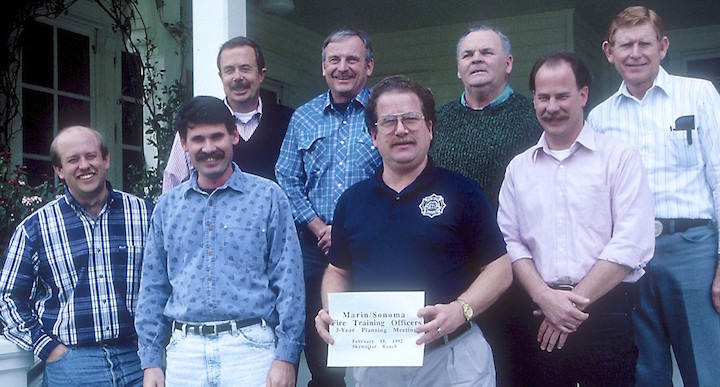 The Marin/Sonoma Fire Training Officers Association, 1982-2010. One of the annual planning meetings held by the officers of the group and the Chief Association liaisons, this one in 1993 at Skywalker Ranch. (l-r) Tom Forster, Skywalker; Brian Meuser, Marin County, Fred Bunker SRJC; Bob Mariani, Kentfield; Barry Gaab, Sonoma County DES; Bill Lellis, Larkspur and College of Marin; Mark D'Ambrogi, Rincon Valley, unknown. Photo by Maureen Forster. by Division Chief Fred Bunker, Sausalito FD, retired, and Santa Rosa JC Fire Technology Director, retired. The Marin Sonoma Fire Training Officers Association (MSFTOA) was created when both Marin and Sonoma county fire training officer associations were struggling in the early 1980's for membership and participation. A decision was made to try out having a joint two-county association. This strategy worked well for the next 28 years. The group organized regional training including mutual aid drills, among many other accomplishments. It all came about when Carl Goodson, then Director of Fire Science at SRJC, recommended consolidating the College of Marin and Santa Rosa Junior College fire service videos into a Marin-Sonoma Fire Film library. After the Film Library merged, both Marin and Sonoma Fire Training Officers began inviting each fire agency to various training events, such as Hamilton Air Force Base controlled training burns, High Angle Rescue practice sessions, Oil Fire Training at Chevron Oil Refinery in Richmond, etc. Chief John Rentz of Novato FPD asked Novato Captain Tony Bacon and I to check out a Fire Academy Program that was consolidated with fire agencies in the South Bay. He also asked us to contact and to participate in a South Bay Mutual Aid Drill. That led to the series of very successful MAD's with our Marin and Sonoma Fire Agencies. Known as "MAD" exercises (Mutual Aid Drills), they rotated between counties every year from 2002-2010. Topics included Wildland Urban Interface fires, Hazardous Materials, Structural Firefighting, and Terrorism. We also began holding the first Fire Academies on a rotating basis using Hamilton AFB in Novato and the Santa Rosa FD Training Tower, and also began using training officers from both counties as Instructors. Over the years we also incorporated many Instructors from the 'State Instructors Workshop' held each year (Fresno, San Jose, Sacramento and San Diego)." Examples of achievements included: Joint Fire Training Film Library; Fire Instructor Development; Peer Assessment for Instructor certification at the State Fire Marshal's Office; SRJC Accredited by then State Fire Marshal Chief Ronny Coleman, State Board of Fire of Fire Services recognition as a Regional Firefighter I Academy (1995). ; Chief Carl O. Heynen (Alto-Richardson Bay Fire Protection District) $50,000 Memorial Scholarship awarded to SRJC; Chief Winn Smith (Glen Ellen FD) $3,000 Memorial Scholarship awarded to SRJC; Skid-Truck Apparatus Grant (CDF/CAL FIRE) $30,000; Holmatro Rescue Tools - Auto Extrication (RS3 - Steve Carpenter& Dave Stinnett) Grant = $120,000. Wildland Fire Academies were offered through Marin County FD and CAL-Fire Santa Rosa. We shared hundreds of technical and manipulative lesson plans for firefighting training. Fire Officer and Chief Officer Courses were offered. Rescue Practices (R-1), Auto Extrication, Hazardous Materials recognition and operations, Fire Cause and Origin, Strike Team Leader, Arrest Search and Seizure (PC 832) and Fire Prevention classes were offered through SRJC. Many workshops and seminars were also offered: examples include Fire Ground Commander by Chief Alan Brunacini of Phoenix FD and NFPA, Ethical Leadership in the Classroom by State Fire TrainIng, Heavy Rescue by Captain Wes Kitchel of Santa Rosa FD, along with helping organize many Fire Instructor Workshops at Fresno, San Jose, Sacramento, and San Diego, Radiological Monitoring, and Effective Management. The group reported to and was a section of both County Fire Chief's Associations, and conducted annual goal planning sessions starting in 1989, typically facilitated by Tom Forster. Generally the role of President was rotated between each County every other year, and leaders would work their way up through the officer roles starting as Secretary. Speakers were often hosted at the general membership meetings, including for example, Battalion Chief Neil Honeycutt of Oakland FD speaking on the great Oakland Fire of 1991, and United Airlines pilot Alfred C. Haynes speaking on the crash of United Airlines Flight 232 in Sioux City Iowa on July 19, 1989. 28 years after it's founding, the growth and training challenges in both counties led to a decision to end the group in 2010. The traffic and commute challenges due to the morning backup on Highway 101 had lowered meeting attendance between the counties, and the organizational and coordination difficulties had become too much. While a cooperative interest still continues to this day, both counties went back to having their own Training Officer Associations. See slide show Photos below and a video of a MAD at Infineon Raceway in 2004. Scroll over the photo to click the play button. Videos from Annual Marin/Sonoma Mutual Aid Drills, abbreviated as MAD. The 9-minute long Documentary Video of the 2004 Mutual Aid Drill, hosted by the Infineon Raceway and the Marin Sonoma Fire Training Officers Association. This drill had a terrorism scenario - it was held a few years after 9-11. See video credits for a complete listing of those who organized the drill and participants. Click the symbol before the word Vimeo in the lower right for full screen. Video courtesy of Tom Forster. This is a 5-minute Documentary video of the 2005 MAD, or Mutual Aid Drill. The scenario was for an urban interface fire in Mill Valley on the slopes of Mount Tamalpais, including evacuation of Blithedale Canyon and shelter. The plan was to exercise the Mt. Tam Mutual Threat Zone plan, or MTZ Plan. The day included classroom and field training at College of Marin, and in Larkspur, Corte Madera, and Mill Valley. Speakers include now retired Marin County FD Battalion Chief Tim Thompson, now retired MCFD Training Officer Brian Meuser, Captain Greg Reynolds from the San Diego Sheriff's Office and a CalFire Battalion Chief reviewing the tragic Cedar Fire when Novato Firefighter Steve Rucker was killed, Mill Valley Battalion Chief Mike St. John, Captain Angel Bernal from Mill Valley PD, and now retired Larkspur Captain Jim Clark. Also pictured are now retired Mill Valley Chief Jeff Davidson, now retired Sonoma County Chief Barry Gaab, and others. The exercise also include CERT Teams from Mill Valley, the American Red Cross, and the Marin County Humane Society. Video by Tom Forster.